Pakistan’s new Prime Minister Imran Khan was sworn in at a ceremony in Islamabad on Saturday, ushering in a new political era as the World Cup cricket hero officially took the reins of power in the nuclear-armed country. The ceremony at the President’s House in the capital marks the end of decades of rotating leadership between the ousted Pakistan Muslim League-Nawaz (PML-N) and the Pakistan Peoples Party (PPP), punctuated by periods of army rule. 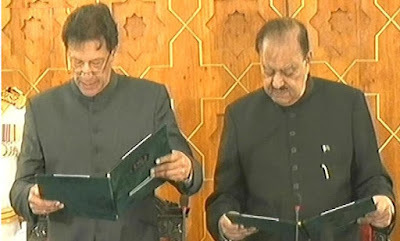 A tearful Khan, clad in a traditional black sherwani, smiled as he stumbled over some of the words of the oath administered to him by President Mamnoon Hussain during the ceremony, televised live by the state broadcaster PTV. He swore to “bear true faith and allegiance to Pakistan”, and to “discharge my duties and perform my functions honestly, to the best of my ability… and always in the interest of the sovereignty, integrity, solidarity, well-being and prosperity of Pakistan”. The 65-year-old former cricketer, who captained Pakistan to World Cup victory in 1992, had won a confidence vote in the National Assembly the previous day. In parliament on Friday he came out fighting with a divisive speech in which he vowed to hold corrupt officials accountable. The July 25 election that brought his Pakistan Tehreek-e-Insaf party to power was branded “Pakistan’s dirtiest”, with accusations throughout the campaign that the military was trying to tilt the playing field in Khan’s favour. The army and Khan have denied claims from rival parties of “blatant” vote rigging. Khan’s third wife, Bushra Bibi — formerly known as Bushra Maneka — kept her eyes cast modestly downwards during Saturday’s ceremony. It was her first public appearance since their wedding earlier this year, and she appeared escorted by tight security and covered from head to toe in a white niqab, a conservative garment by Pakistani standards. Khan had invited the rest of the 1992 cricket team to the ceremony, and fast bowler Wasim Akram was pictured smiling among the crowd. No prime minister of Pakistan has ever completed a full five-year term. Khan will have to contend with the same issue as many predecessors: how to maintain a power balance in civil-military relations. Another cricketer-turned-politician, India’s Navjot Singh Sidhu, was seated in the front row and earlier warmly embraced the powerful Pakistan army chief General Qamar Javed Bajwa. Later, Khan went to the Prime Minister’s house in the capital, where he was met by a guard of honour. Khan campaigned on promises to end widespread graft while building an “Islamic welfare state”. “I promise to my God that everyone who looted this country will be made accountable,” he said in Friday’s speech to parliament. He also defended himself against widespread claims the military had targeted the formerly ruling PML-N, especially its leader Nawaz Sharif, and fixed the playing field in Khan’s favour. “I am here after 22 years of struggle. No dictator has taken care of me. I am standing here in this parliament on my own feet,” he told the raucous assembly as opposition members shouted protest slogans. Pakistan’s 71-year history has been punctuated by coups and assassinations, and the 2018 election was only its second ever democratic transition of power from one civilian government to another.